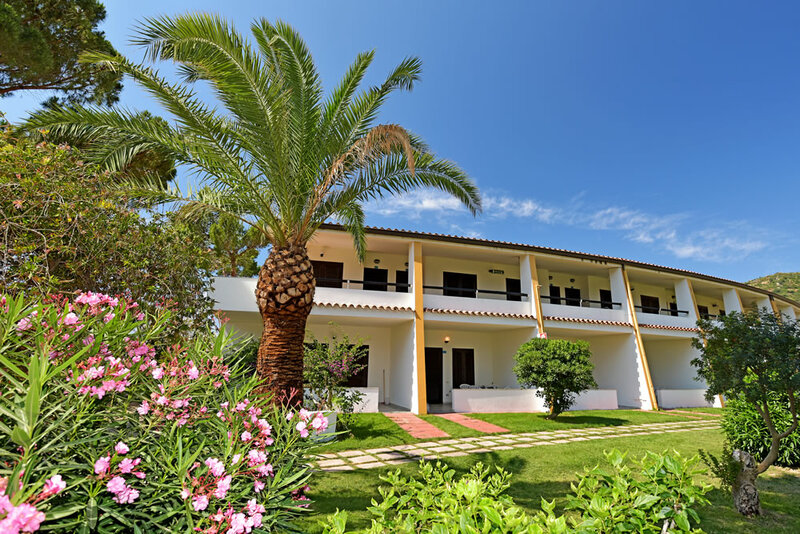 Two bedroom apartments, Bungalows and Villas: the Cormoran Residence in Villasimius offers a wealth of accommodation choices to create your dream holiday, to suit your pace of life, your schedule, completely independently. All the apartments, bungalows and villas are surrounded by greenery and are just 90m from the splendid Campus beach. Away from the chaos of everyday life, with every luxury to hand, you will feel like time is standing still. The two-room Apartments of the Cormoran Residence composed of 2 areas: 1 double bedroom, 1 bedroom with two single beds, a kitchenette, a contemporary bathroom with shower, private veranda/double veranda and garden views available on the ground floor , or 1 ° upper floors with a terrace and sea views. The Cormoran Residence villas spans 5 areas over three levels: 2 double beds, 2 little room with 2 separate beds, one leaving room wit sofa bed, a separate kitchenette with microwave, dishwasher and washing machine, 2 bathrooms with shower and an outside veranda with a table and chairs. It is a fantastic location with the best beach in the area, with just the right amount of parasols perfectly distant one from the other, which are not in the way and are close to the rooms.